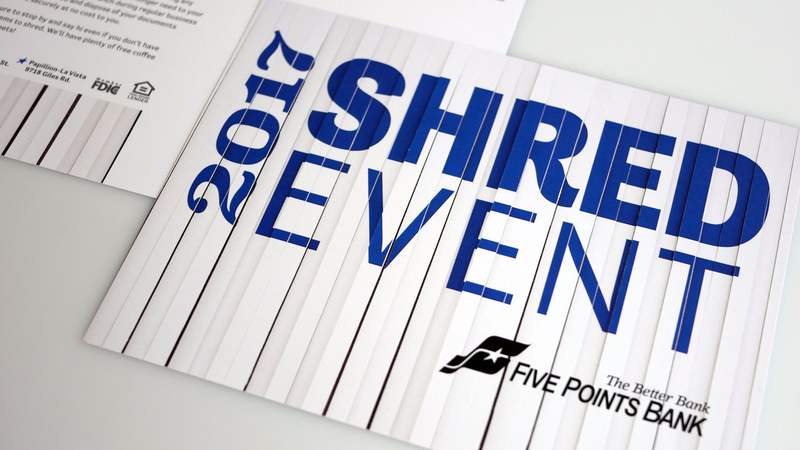 Five Points Bank was looking to refresh their annual shredding event direct mail piece. In the past, the imagery took a digital approach to creating imagery. As soon as they said shred, I knew I had to actually shred the postcard. Although, after testing with an actual shredder, I decided to carefully cut the strips with an xacto knife to produce a clean, tactile effect. They were looking for two concepts to choose from so I provided a backup with shredded paper as the background and a traditional color overlay. They loved both and decided to send one concept to current customers and the other to prospects.